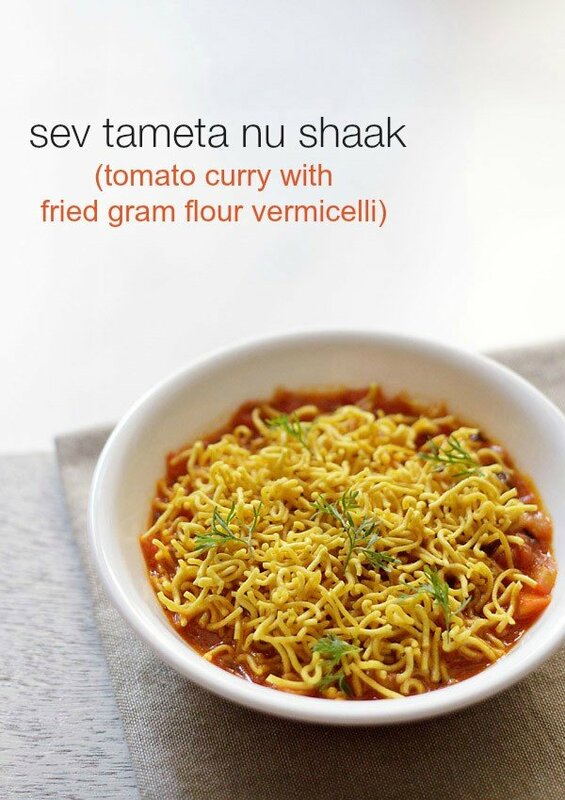 sev tameta nu shaak is a spicy, tangy and sweet tomato curry topped with sev (crisp fried gram flour vermicelli). 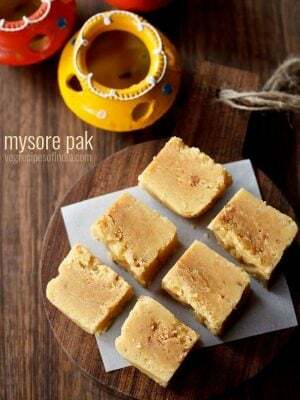 easy and quick no onion no garlic recipe. 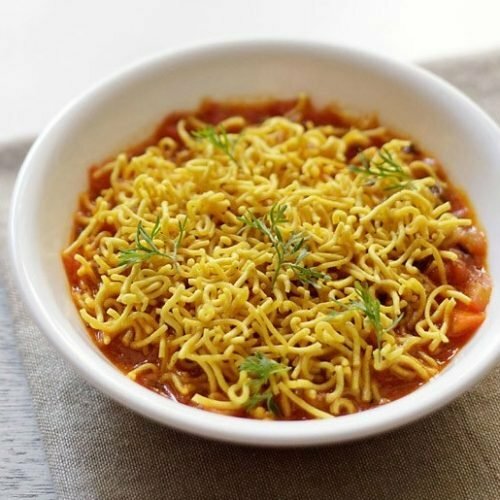 sev tameta nu shaak recipe with step by step photos – here’s a quick & easy gujarati recipe of sev tamatar sabzi. basically spicy, sweet and tangy tomato curry topped with crisp sev. i had got a couple of requests to post this recipe. one recipe request was a dhaba style version too. what i am posting now is a homely no onion no garlic version. 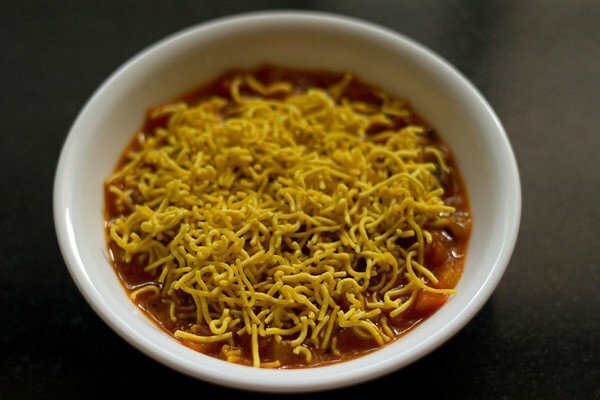 i will be adding the dhaba style sev tamatar sabzi also in some time. an easy no frills curry recipe that takes about 20 to 25 minutes to prepare. 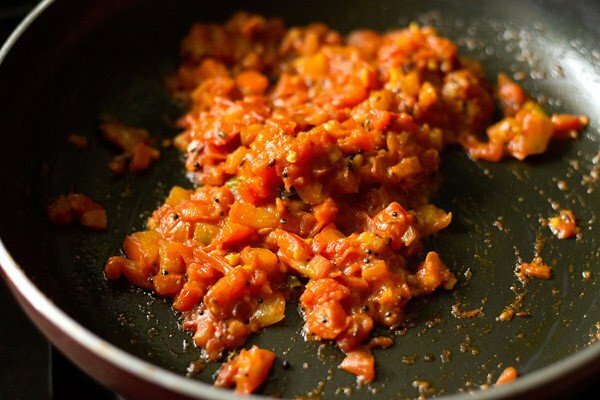 this sev tomato shaak is too good and the sev adds a lot of flavor, taste and texture to the dish. 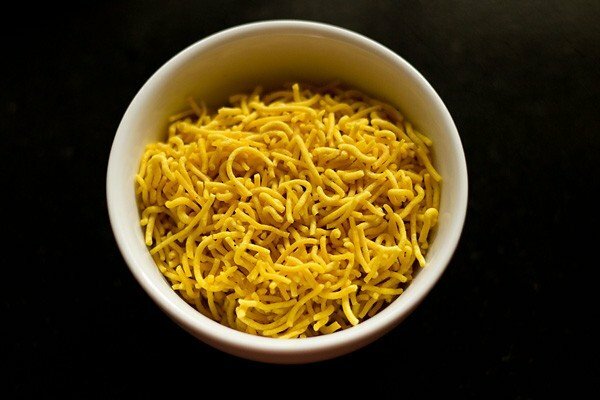 sev are are crisp fried gram flour vermicelli. if you live outside india, you can get them easily in an indian grocery or sweets shop. you can buy them online too. 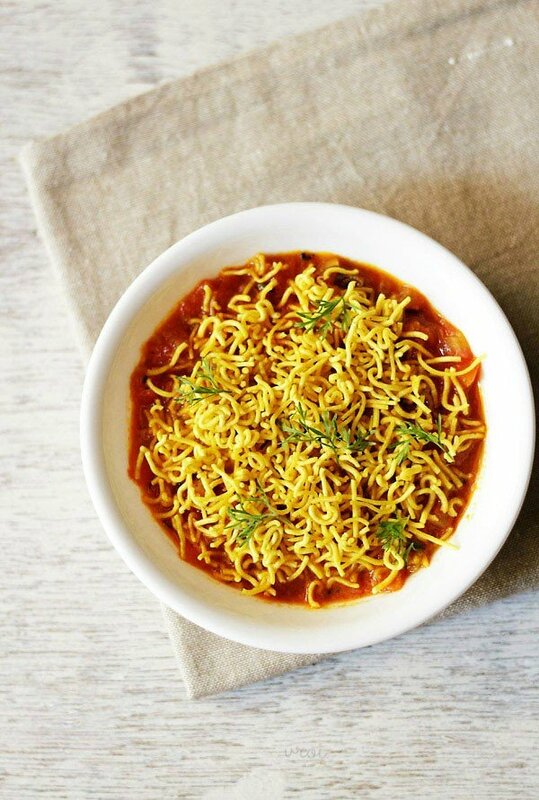 the variety i added to this shaak or sabzi was slightly thick than the fine sev variety we use for chaat items like sev puri, bhel puri etc. you can use any variety. sev tameta nu shaak can be served with soft phulkas or chapatis or bajra rotis. 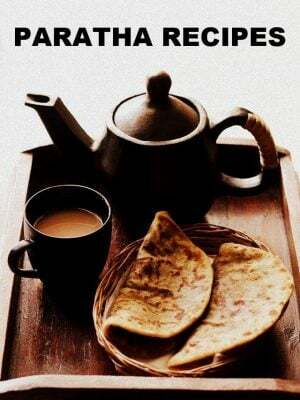 also tastes good with thepla. the shaak will taste nice with bread too. first rinse and then chop the tomatoes, ginger and green chili. heat oil in a pan. add mustard seeds and crackle them. then add cumin seeds and saute till they change color. a few seconds. then add chopped ginger, green chilies and asafoetida. stir and saute for 10 to 12 seconds till the raw aroma of ginger goes away. stir and then add spice powders - turmeric powder, red chili powder, coriander powder and cumin powder. stir well and saute for a minute. then add salt and sugar. stir and saute. 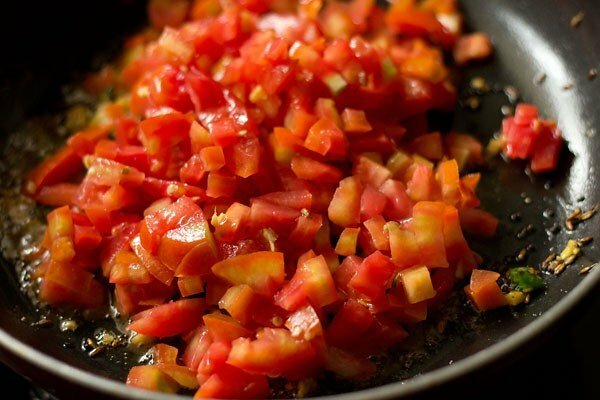 you have to stir a few times so that the tomatoes get cooked evenly. then add water. stir very well. 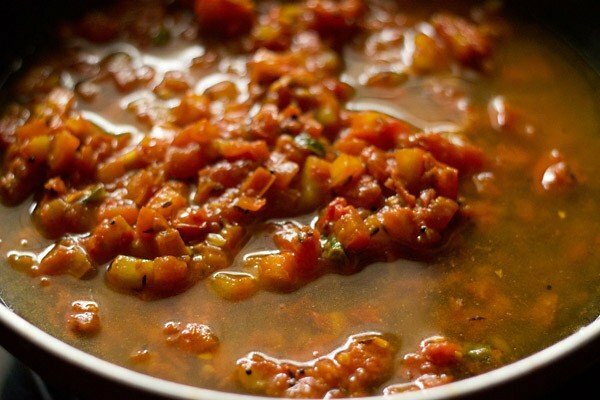 bring the tomato curry to a simmer. switch off and check the taste. add more salt and sugar if required. you can make the curry more thick also, if you prefer. 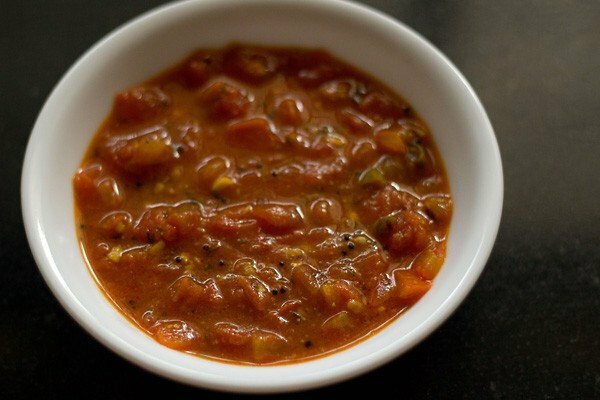 when done, pour the tomato curry or sabzi in serving bowl/bowls. sprinkle sev all over on the serving bowl/bowls. 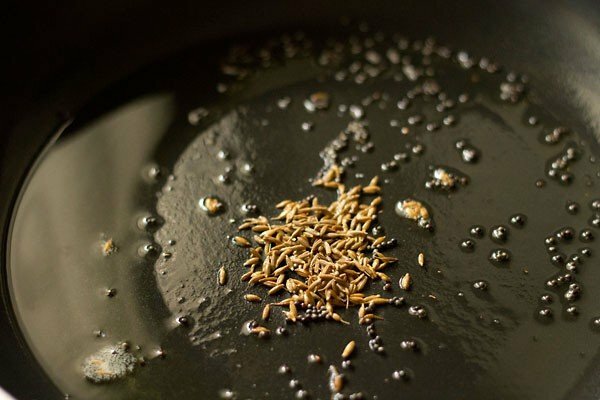 garnish with coriander leaves and serve the sev tameta nu shaak with phulkas, chapatis or methi thepla or bajra rotis. 1. the recipe contains not many ingredients. basically chopped tomatoes, ginger and green chilies. 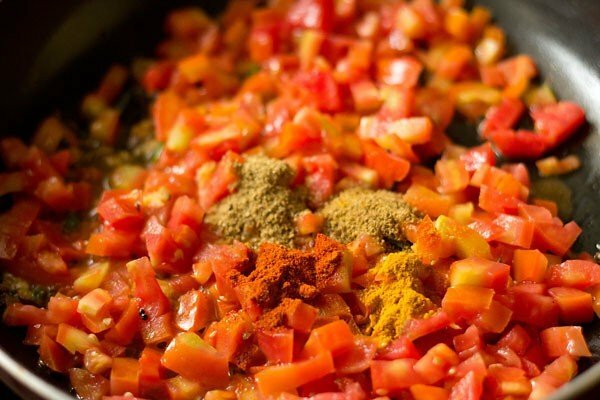 tomatoes form the main base of this curry. 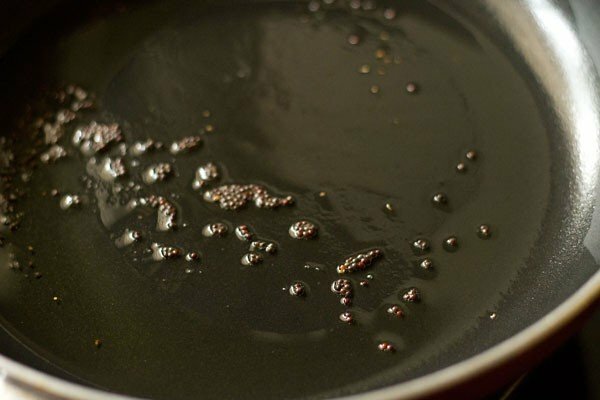 2. heat oil in a pan. add ¼ tsp mustard seeds and crackle them. 3. then add ½ tsp cumin seeds and saute till they change color. a few seconds. 4. then add 1 tsp finely chopped ginger, ½ tsp green chilies and a pinch of asafoetida. stir and saute for 10 to 15 seconds till the raw aroma of ginger goes away. 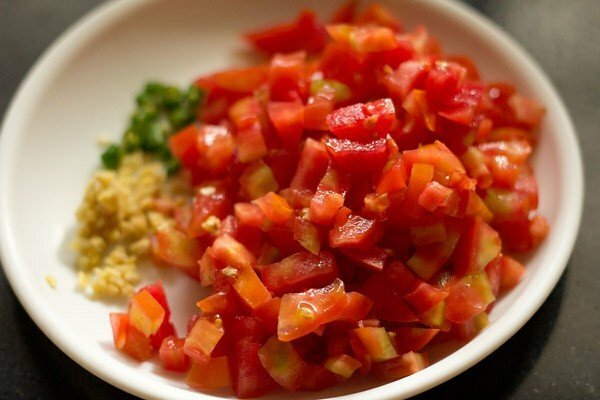 5. add the 1½ cups chopped tomatoes. 6. stir and then add spice powders – ¼ tsp turmeric powder, ¼ tsp red chili powder, ½ tsp coriander powder and ½ tsp cumin powder. to make the dish more spicy, you can add up to ½ tsp red chilli powder. 7. stir well and saute for a minute. 8. then add ¾ tsp sugar and salt as required. 9. stir and saute. 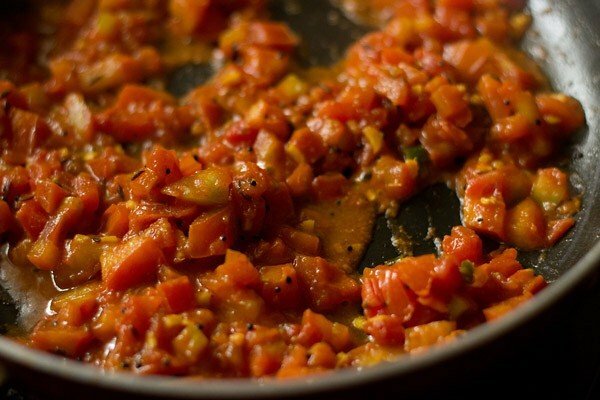 you have to stir a few times so that the tomatoes get cooked evenly. 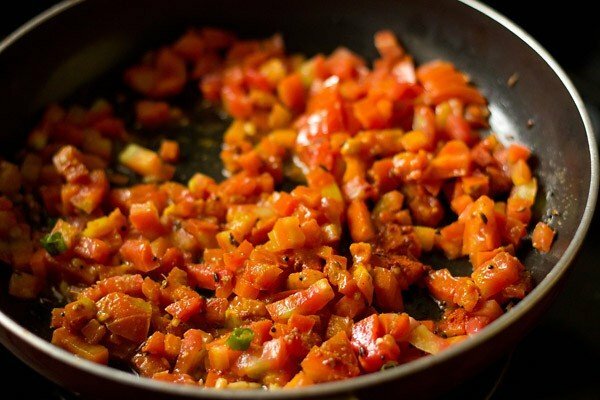 10. saute till the tomatoes soften. 11. then add ½ cup water. 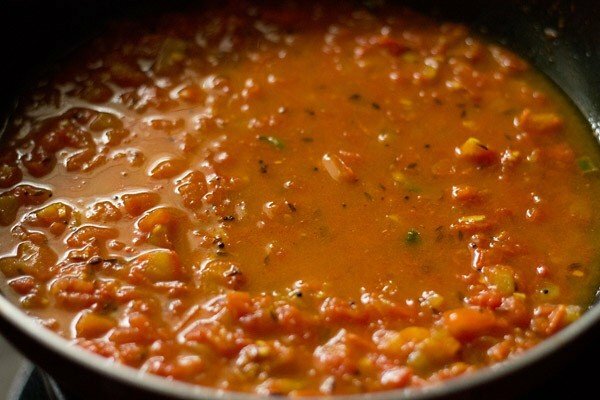 13. bring the tomato curry to a simmer on a low to medium flame. switch off and check the taste. add more salt and sugar if required. you can make the curry more thick too, if you prefer. 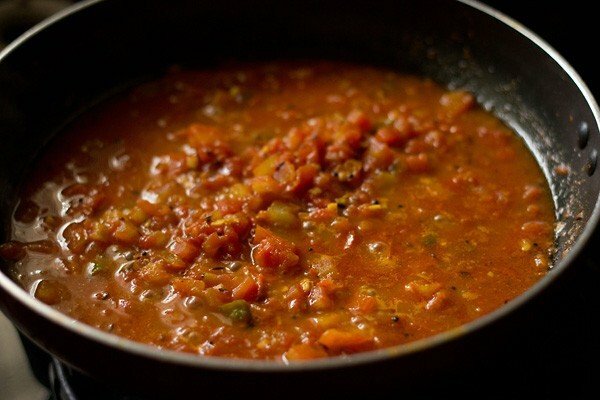 14. when done, pour the tomato curry or sabzi in serving bowl/bowls. 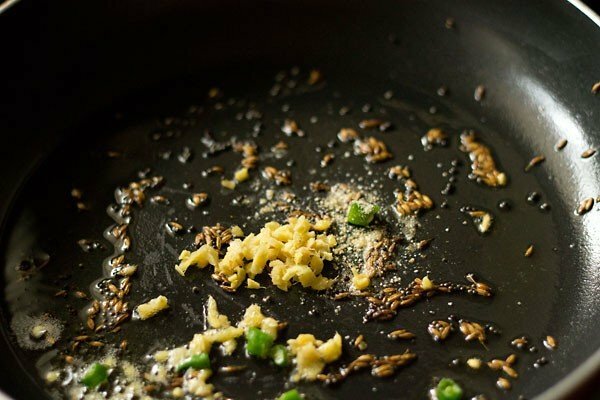 15. sprinkle sev all over on the serving bowl/bowls and serve immediately. otherwise the sev gets soggy. add sev just before serving. since we prefer the crispness of the sev, i have added them while serving. 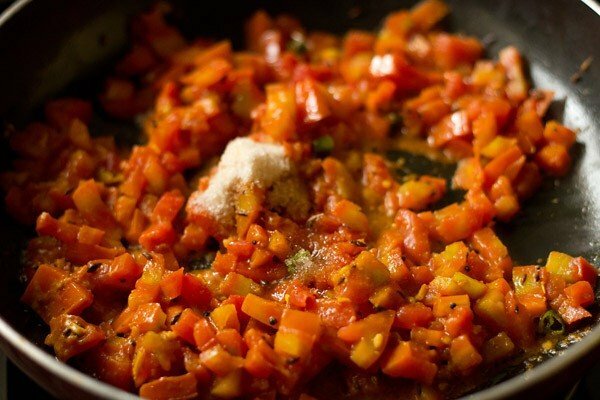 if you want you can add the sev when the tomato gravy is done and cook them for a minute or two. 16. garnish with coriander leaves and serve the sev tameta nu shaak with phulkas, chapatis or thepla or bajra rotis. 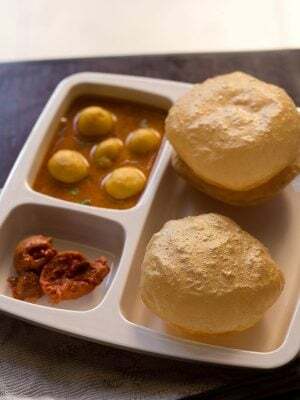 I would like to know recepi for mung Dall vada,fairly large ,smooth,soft as sold in Indian take away . One we make at home is generally small and not as soft and tasty as from gujarati take away places like Leicester in UK. Made for lunch and we enjoyed it. Thank you very much. Many thanks for those relishing recipes. I have been waiting for a good pasta sauce/gravy recipe. Just to remind you I have requested this earlier also. I am a big fan of u guys…. 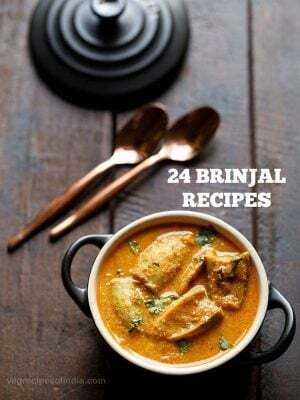 I have gone through and tried a few recipes and they are all so easy to follow, and have always received praises from each and every one who have tried the recipes….. Love it…. Thanks guys…. thanks a lot vipul for sharing this positive feedback. glad to know that recipes are turning out good and you are getting appreciation for it. happy cooking. 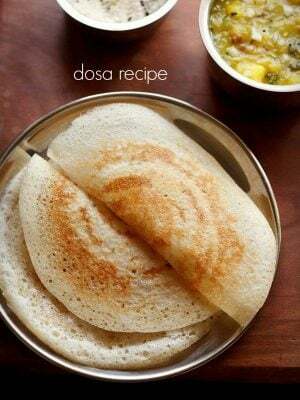 Hi Dassana, all your recipes are very easy and clear. 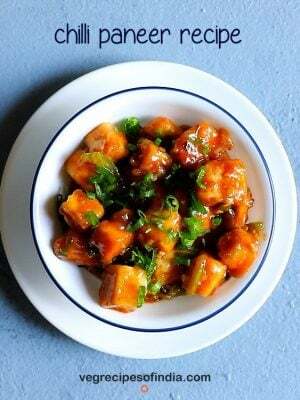 I tried paneer yesterday and it turned out good. thanks celine for sharing positive feedback on recipes. Yummy gravy! 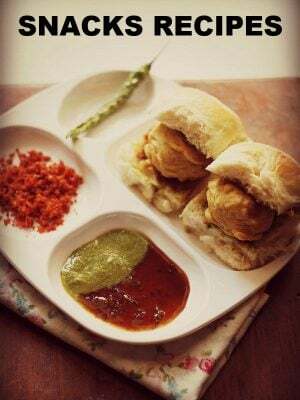 Can easily gulp additional phulkas with this!!! Love this one. Haven’t eaten it for a long time now…Mom use to make it a lot for me.